Is My Colorado Springs Tap Water Safe to Drink? Tap water is a great resource for many household purposes but is it safe to drink? This questions often gets bounced back and forth and in many instances the answer depends on where you live. Tap water does provide excellent availability, but it can contain harsh chemicals from water treatment plants or have acidic qualities if it comes from a well. Just how do you know if it is safe to drink? What should you do to make it safer for you and your family? Discolored water can mean that there is rust or other harsh substances in the water pipes. This could be the result of various pipeline malfunctions and other things that will release substances into the water supply. If it is murky or discolored, it is wise to avoid drinking the water to keep those substances out of your body. Does Your Water Smell Strange? Many of us have experienced getting a glass from the cabinet, putting it under the faucet and turning the water on only to be accosted by an odd smell. This can happen for a variety of reasons, many of which have to do with how treatment plants treat the water. Does Your Water Leave Mineral Rings in Sinks and Toilets? If you get your water from a well, you can generally tell how hard the water is by what it leaves behind. Hard water will often leave a tough white residue on showers, sinks and toilets. This residue is made up of "hard" minerals such as calcium and magnesium. This can be harsh on many surfaces and for your body. Hard water will also sometimes leave you with a dry taste in your mouth. Is Your Water from a Well or the City? It is best to know where your water is coming from to figure out why it is murky, has a strange smell, or anything else that is odd. 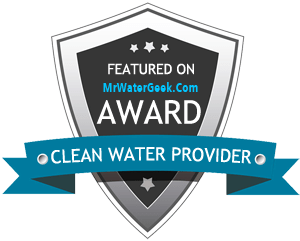 Well water can be better in flavor and quality than city water because it is untreated; however, well water can be hard and acidic, requiring a water softener. Similaryly, it is best to make sure you use a filter for your tap water when using a softener. City water is checked for quality, however, you should always read your water bill in case you receive a boil order. Have You Ever Received a Boil Water Order? If you have ever received a boil water order or been told not to drink tap water for a certain time, then your tap water truly isn’t safe for you to drink. This is more common in rural areas and the population is often expected to have their water delivered or pick up jugs themselves. This water should not be used for cooking or drinking. What are the Benefits of Buying a Home Filter? Water filters in Colorado Springs help to remove unwanted chemicals from treated water. This makes the water safer and tastier to drink. You will find that you are more likely to drink your daily amount of needed water when you use a filter, instead of relying on odd or terrible tasting tap water. While well water is not treated with chlorine that does not mean it is contaminant free. Well water is exposed to essentially anything that is poured outside and soaks into the soil. Gasoline, paint, pesticides, fertilizers, and other leaching contaminants from ground water have the potential to find their way into your well. A home water filter for your Colorado Springs home will help remove these contaminants and keep your drinking water safe for you and your kids. The most common city water contaminant is chlorine. Chlorine is used to purify the water but doesn't leave it so readily. Chlorine is very harsh on the system and while it is generally diluted enough in city water to not cause any serious ailments, it will affect the flavor and overall quality of the water. A water filtration system will help improve the flavor and drinkability of heavily chlorinated city water. Another great benefit to water filtration systems is that you can get filtered water when you want it. This means you do not have to wait around for it to go through the filter or go to the store to buy bottled water. Just simply turn on your tap, and there you have it – easy to access filtered water! Choosing Colorado Springs home water delivery and filtration systems does not have to be difficult and is something you should consider. You will notice just how great your water tastes and may even start to see some incredible health benefits!